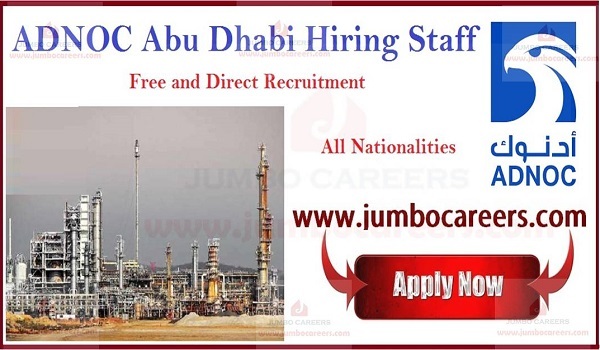 Abu Dhabi National Oil Company is conducting free recruitment in 2019 for hiring experienced staff. About ADNOC: ADNOC abbreviation for Abu Dhabi National Oil Company which is now to be considered a “Supermajor Oil and Gas Company” in the UAE. It is a government owned company which came to begin in operation in the year of 1971 with the guidance and support of H.H. Sheikh Khalifa bin Zayed Al Nahyan who is the President of UAE and Ruler of Abu Dhabi. ADNOC has a massive contribution in progress of the UAE oil and gas sector. According to CEO Message, ADNOC Group is one of the world’s largest oil and gas companies with a production capacity of around 3 million barrels per day. And this leading group counts in the list of 12th largest oil producer in the world. Education: MBA Qualified in Risk Management, Finance or Engineering. Experience: International ERM & Oil & Gas experience. Experience: 15 years experience in Petrochemical, Refining or Gas Processing Plant.